This beautiful allegorical novel highlights the heartrending issues of Palestinians and refugees with a magical style. 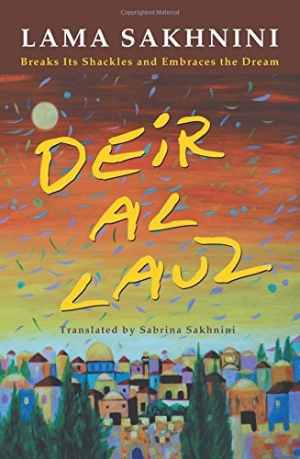 Deir Al Lauz, written by Lama Sakhnini and translated by Sabrina Sakhnini, is a harrowing and stylish novel that chronicles one family’s difficulties in the Palestinian diaspora. Basheer, a devout and quiet Sufi, and his twin brother, Omar, love one another fiercely but could not be more different. Omar is a scientist in a transactional marriage who harbors a growing desire to fight for Palestine’s freedom. He refuses a prestigious scholarship: “What would I do with a PhD in theoretical physics and no country?” He and Basheer each search for meaning in their own ways, both learning that losing a country is about so much more than just land. The twins’ parents experience their own tribulations. Their mother, Baheya, serves as a witness to their internal torment, watching as their passions are at once restricted and moved by the turmoil. She is forced to send her daughter, Zahra, to another home; the house is visible from her own roof but is isolated thanks to impermeable borders. The story is variously narrated by the twins, their mother, and Basheer’s beloved Khawla. These speakers are not always easy to distinguish from one another, though every character is sympathetic. The book’s heavy symbolism sometimes leads to writing that is convoluted or abstract. While the story is far from rosy, there is a fierce current of love and loyalty that runs throughout, and hope holds out. Dazzling personifications teeter on magical realism. In a rare joyous moment, the boys’ mother describes her courtship and wedding, where she recalls “floating on a cloud of the fragrances of wheat from the fields.” A rose comes to life and plays “a heavenly tune on a violin” when she hears that she is loved. These mystical elements are distinct and illustrative. Dramatic monologues are used to reveal characters’ deepest feelings, worries, and regrets; they are satisfyingly theatrical. Khawla’s perspective is particularly heart wrenching. She struggles to overcome her traumatic past and a doomed future, fighting off internal voices that poke at her insecurities and troubles. Deir Al Lauz humanizes the Israeli-Palestinian conflict, which is otherwise too often understood as a sad headline, by making the anger and tragedies of the Palestinians feel personal, accessible, and moving. Sakhnini’s ability to awaken empathy makes hers a significantly impactful and lingering story.